In the week since I’ve returned from America, I’ve noticed something very odd in the West End of Aberdeen. 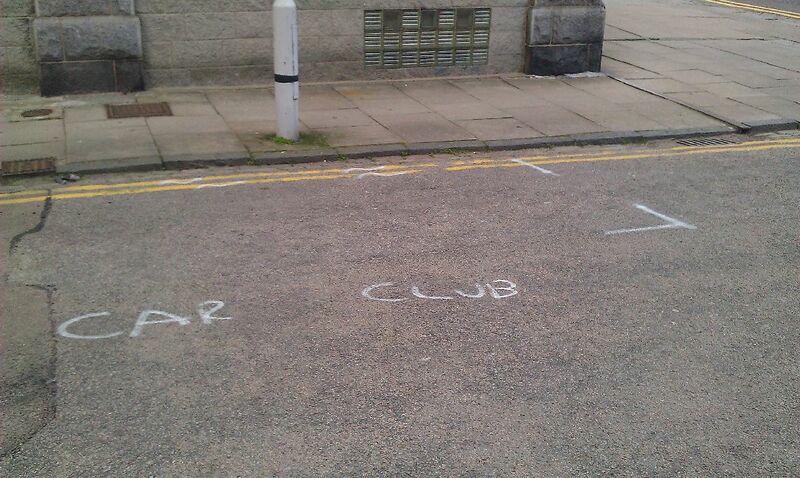 The obvious implication of these road markings is that if you’re a member of ‘Car Club’ then you are permitted to park in what is normally a no parking zone (note that the double yellow lines have been squiggled out). This doesn’t seem fair at all – my girlfriend recently had to pay £80 for an annual council parking permit – if she could have joined ‘Car Club’ for say, £79 or less then I’m almost certain she would have. It just makes sense. Bizarrely, I’ve seen lots of these makeshift parking spaces and yet I don’t know where they’ve come from. I can’t find anything about them online and noone I’ve spoken to seems to know anything about them. I can only suppose that if you’re a member of Car Club, competing for a handful of semi-legal parking spaces, you do not talk about Car Club. Edit: I’ve had a few suggestions that the road markings may have something to do with City Car Club, a self-service Car Rental Agency. This doesn’t seem to be the case. Hmm.